This is the first of many turkey recipes you'll find on this site. Along with a couple tips adapted from the food network. I love to cook by taste so you will rarely find exact measurements of ingredients. If a recipe calls for ingredients that you are not familiar with, start with a small quantity until you are comfortable enough to know how much you want to use. To make this turkey, use a very shallow pan,more like a cookie sheet than a pan.This will help even out the heat from the oven that comes up from the sides of the pan so that it will not dry out the breasts. It was also suggested to use two smaller birds rather than one large one. After you open your turkey take it to the sink and give it a thourough rinse with cool water both inside and out. This of course is after you've removed the neck and the bag of inner organs. 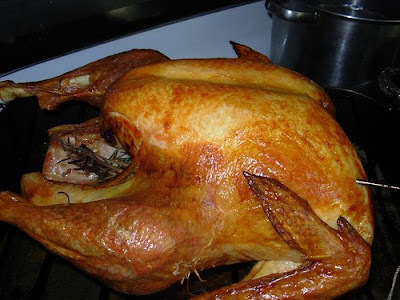 Dry your bird with a clean white cloth or paper towel, otherwise the seasonings you put on the bird will just fall off. Mix together some fennel, salt, and pepper to make a dry rub, and put it all over the bird. Ready the pan by sprinkling extra virgin olive oil on the bottom of the pan. Then place some carrots cut in vertical halves alternating with whole stalks of celery. You will then place the turkey, breast side up on this nest of veggies. Sprinkle the bird with olive oil and insert two lemon halves into the open cavity,and put it in a 425 degree oven. This is quick roasting and you can set the oven as high as 500 degrees if you'd like without fear of drying out the bird. Once the turkey is browned enough you can tent some tin foil over it and turn down the heat if you'd like. Your turkey is done when the juices run clear, the legs loosen, and the temperature is at least 165 degrees. It's very important to allow the meat to rest uncarved for about 15 to 20 minutes after you've removed it from the oven. You can then drain off some excess fat from the pan and use those wonderful brown bits stuck to the bottom along with the juices from the veggies to make your gravy base.